How much does it cost to travel to Paracas? How much money will you need in Paracas? S/.74 ($22) is the average daily price for traveling in Paracas. The average price of food for one day is S/.38 ($12). The average price of a hotel for a couple is S/.58 ($18). Additional pricing is in the table below. These average travel prices have been collected from other travelers to help you plan your own travel budget. Paracas, also known as El Chaco, is a resort town on the Southern coast of the country, about 150 miles south of Lima. The town in located in one of the oldest regions of Peru, with a history dating back to 900 BC and offers many pre-Inca cultural sites throughout the area. Paracas is possibly best known for being home to the Paracas National Reserve, a nature reserve boasting one of the most abundant and diverse ecosystems in the world. Paracas experiences a dry and hot climate, especially with their desert landscape. Sandstorms are a fairly common occurrence, so be sure to bring sun glasses wherever you go! The most popular sight in Paracas is the Paracas National Reserve, a scenic nature reserve that is designed to protect the biodiversity and archaeological sites located within. Here, you'll see stunning views of where the desert landscape meets the sea, find yourself on deserted beaches, and enjoy wildlife such as flamingos, lizards, and sea lions. Archaeological sites within the reserve date to pre-Inca cultures from 900 BC. Near the entrance to the National Reserve is the Julio C. Tello Museum, a great place to begin your adventure into the reserve. The Museum displays a few ancient artifacts and delves into the history of the people who lived in the area thousands of years ago. The museum also emphasizes the conservation efforts to ensure the health of the reserve. Dive deeper into the Inca culture at the Tambo Colorado, an archaeological site that has a well-preserved Inca urban center. The town center, which has the majority of restaurants, hotels, and resorts. You'll also find the visitors center here. Paracas Peninsula, where you'll find the Paracas National Reserve along with the famous candelabra that is carved into the hillside and dates back to the pre-Inca cultures. The Bay of Paracas, located on the north end of the peninsula, is a historical site with a lot of importance to the Peruvian people. This is where Jose de San Martin disembarked on his trip to Spain to fight for independence. Along with it's historical significance, it is also a popular scenic area, especially with the flamingos who relax along Sequion beach. Pisco, the capital city of the region and located just north of the Paracas town center. Pisco was founded in 1640 and is complete with colonial buildings and a fisherman's wharf which offers amazing seafood restaurants. 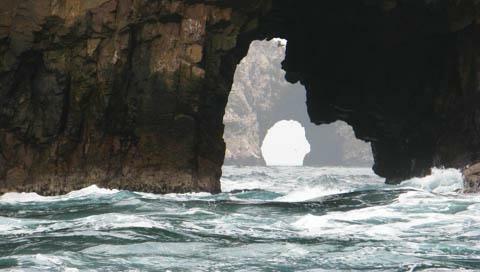 Ballestas Island, located a two-hour boat ride off the Paracas coast. The island offers scenic views of the surrounding area along with chances to see local wildlife like dolphins and sea lions. Take a scenic day trip to the Islas Ballestas (Ballestas Island) where you'll see the famous candelabra etched into the hillside. There are quite a few theories as to how the candelabra got there, as it dates back to the pre-Inca period, although none have ever been confirmed. The Island is best known for their lush wildlife, including dolphins, Peruvian pelicans, sea lions, and Humboldt penguins. There a few different tour companies that offer a variety of day-trip adventures. For something a little more adventurous, rent a bicycle and explore the Paracas Peninsula. You can ride the bicycle through the Paracas National Reserve, although be sure to get out early before the winds get too strong! Food in Paracas tends to be a little more expensive, in terms of Peruvian prices. A few restaurants offer set daily meals that are cheaper than the menu options, although these are not usually advertised. If you want to see what this daily meal is, ask for the "menu del dia". There are also plenty of budget options located on the seafront boulevard and open air grills start up in the evenings. Build yourself a picnic with cheese, bread, and empanadas from vendors on the pier and enjoy your food along the seaside. Be advised that those with sensitive stomachs may not be able to handle the tap water. Try to drink bottled water and use your best judgment when eating salads and other foods possibly prepared with tap water. Paracas is easiest to get to via bus from larger cities like Pisco and Lima. There are countless bus operators ranging in price. Some of the cheaper buses only go to Pisco, although it is easy enough to catch another bus or taxi from Pisco to get to the Paracas city center. When in Paracas, walking is your best bet as everything is within walking distance. Taxis are also abundant, although be sure to agree on a fare before getting into the taxi.